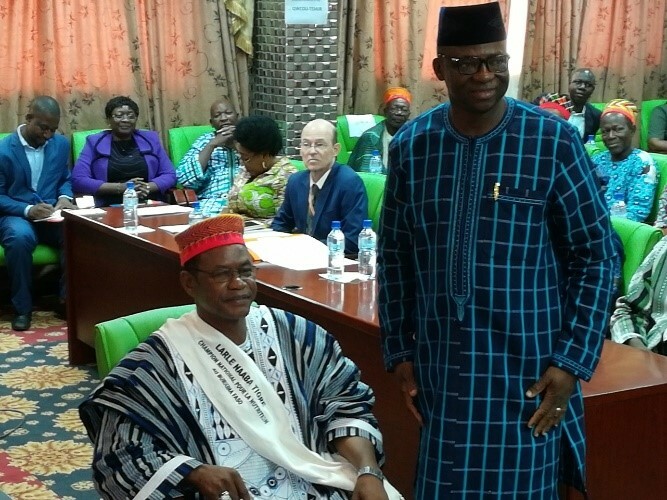 On the sidelines of the first session of the National Nutrition Consultation Council (CNCN) to be held in 2018, Burkina Faso officially inaugurated its « “National Nutrition Champion”, His Majesty Larlé Naaba. Held on 17 July 2018 at the Royal Beach Hotel in Ouagadougou, the ceremony was chaired by the Prime Minister and Head of Government, His Excellency Mr Paul Tieba Kaba. The inauguration ceremony was attended by the Ministers of Health (President of the CNCN); Agriculture and Water Infrastructure (1st Vice-President of the CNCN); Social Action; National Solidarity and Families (2nd Vice-President of the CNCN); Foreign Affairs and Cooperation (MAEC); and Infrastructure. This session’s work was led by the Minister of Health, (President of the CNCN) with the support of the Resident Representative of UNICEF, the leader of the nutrition Technical and Financial Partners (PTF Nutrition) and the Resident Representatives of WHO and WFP in Burkina Faso. In his speech, the Prime Minister said that the high level of mobilisation in the CNCN bore witness to the synergy of action sought for the effective implementation of the multi-sectoral nutrition policy. He confirmed that the multi-sectoral coordination of nutrition occupies a prime place in his Government, hence the creation of a technical secretariat for food and nutrition (STAN) directly reporting to the Office of the Minister of Health. The creation and operationalisation of this secretariat is intended to step up the pace of the outcomes expected of the National Economic and Social Development Plan (PNDES), through improving public nutrition, especially that of vulnerable groups, as contained in axis 2 of the plan dedicated to the development of human capital. He also recalled that the question of nutrition cannot be resolved by Government action alone; that is why he expressed the gratitude of the Government to all the partners who work to improve the nutrition of the people. These organisations include, among others, the United Nations, the World Bank, NGOs, the SUN Movement platforms (especially Resonut), women’s associations and groups, etc. His Excellency the Prime Minister added that nutrition advocacy needed to be enhanced at every level. 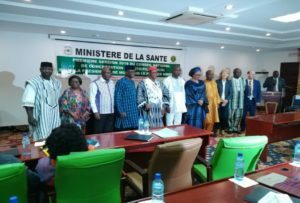 That is why Burkina Faso has appointed a National Nutrition Champion under the aegis of the Ministry of Health, to be a catalyst for ongoing actions to improve nutrition in Burkina Faso. The Minister of Health, Prof. Nicola Meda, who is also President of the CNCN, spoke of the four main qualities expected of a “ champion“: Visibility, Exemplarity, Advocacy and Influence. Professor Meda went on to say that His Excellency Larlé Naaba, a Minister of His Majesty Mogho Naaba, the Supreme Traditional Chief of the Mossi (the majority ethnic group in Burkina Faso) was the perfect incarnation of all these qualities, hence his selection to be Champion. He congratulated His Majesty on this distinction and emphasised the complexity of the task that awaited him, at the same time reassuring him of the support of the health ministry, before proceeding to officially inaugurate him as “Champion national en nutrition” and wishing him every success. He hailed the choice of Larlé Naaba as a recognition on the part of the entire nation for his actions to improve food and nutrition security and for his fight against poverty through innovative, local approaches. He spoke of the weight and immensity of the task in his role as a leader of opinion and actor in the field. He welcomed the dynamic of the synergy of actions that needed to be maintained and strengthened, recalling the African proverb, “If you want to go fast, go alone. If you want to go far, go together”. He took the opportunity to invite policy makers, civil society organisations and TFPs to pool their efforts to put an end to malnutrition and make Burkina Faso a country that was good to live in, a Burkina freed from hunger and malnutrition. His Excellency Larlé Naaba explained that his passion for nutrition started more than 28 years ago. When he was chosen to be a minister of Mogho Naaba (King of the Mossi), he had to choose, as was customary, three “reign” names that would characterise his mandate. He chose “Tiger”, literally meaning ‘abundance’, to signify that his mandate would be characterised by plenty, reducing hunger and general well-being. It was this vision that led him to develop innovative initiatives in agriculture and livestock breeding to improve the quality of life of the people in general, and of women and children in particular. His latest innovation was a legume called the Mung Bean, which His Majesty hopes to use to wipe out hunger in Burkina Faso in the course of the next ten years.